Before I continue, I should clarify that I am woefully behind in watching, (ie I’m currently watching episode 86 of Naruto Shippuden) because I put off beginning the anime it for a long time, at first because, based on watching a couple eps of the crappy dubbed version on TV, I didn’t really think it was an anime I’d like, and then, once convinced otherwise, I put it off because I knew that there were character deaths in this series and, as I mentioned, I’m kind of a wimp about that. I didn’t know who died, though, just that some characters that people liked did. That was enough for me. Like I said, wimp. Anyway, I got back to watching it recently, and the event that I didn’t want to have happen happened. It was just as heart-wrenching as I expected. It had an emotional impact on me, just as I knew it would. But now that the event itself is over, we’ve moved into a portion of the story (still linked to the event, but not centered around the specifics of that event) where one of my very favourite Naruto characters, Shikamaru, is the central figure. These past few episodes have been completely Shikamaru-centric and I’ve been LOVING it. They really highlight how completely ingenious and badass he is. He’s a character that I liked from the very first moment he had real screen time on the show. There was just something about him that intrigued me. The only character I like more than Shikamaru is Gaara, whom I love more than I can possibly explain, and I think after these past few eps, Shikamaru has moved up and is now tied with him for first. He’s just that freakin’ awesome. 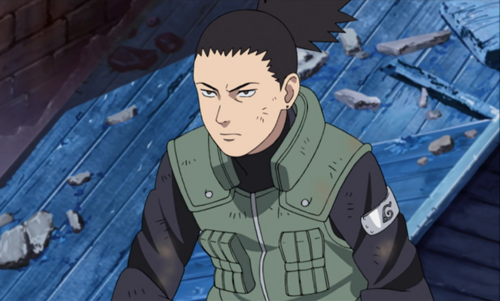 Anyway, there’s no real point to this post other than to gush about my renewed Naruto Shippuden love and how completely amazing the BAMF character Shikamaru is. Really, I should be prepping for one of my classes tomorrow, but I’m playing to my strengths and procrastinating instead.